Centre for Environment Education (CEE) was established in 1984 as a Centre of Excellence in Environment Education of the Ministry of Environment, Forest and Climate Change (MoEF&CC), Government of India. As part of the specialized communication training provided by CSD, the following short term intensive program is available. The course is flexible enough to accommodate your needs and time constraints. The programme aims to improve the quality of media writing and to develop among professionals as well as fresh graduates, the ability to communicate effectively and responsibly on Environment and Sustainable Development issues. The course would be beneficial and stimulating for development sector professionals, students, consultants, local level policy makers, private sector employees who work on or are interested in environment and development issues and in writing about them. 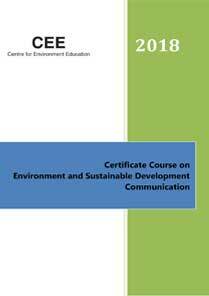 People from any disciplinary background who would like specialised training in environment and sustainable development communication would find it particularly useful.